“Appropriate, Subvert, Activate!” identifies the limitations of urban public space, which has not only been restricted in physical terms but also in terms of self-autonomy and spontaneous social manifestation. This illicit intervention is a call for action that seeks to create and encourage moments of antagonism—however transitory, fragmentary and ephemeral—in which the public connect through conflict, in an attempt to reclaim the “public” status of a so-called public space that that has for long been dominated by private forces. 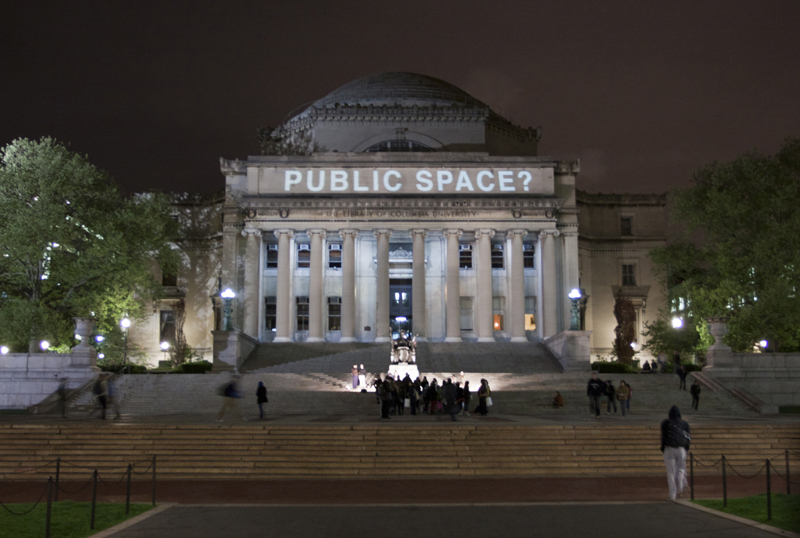 The intention is to question the spatial politics inherent in urban public space, revealing the hidden conflicts and oppressive mechanisms of control that prevent it from being a truly democratic space. 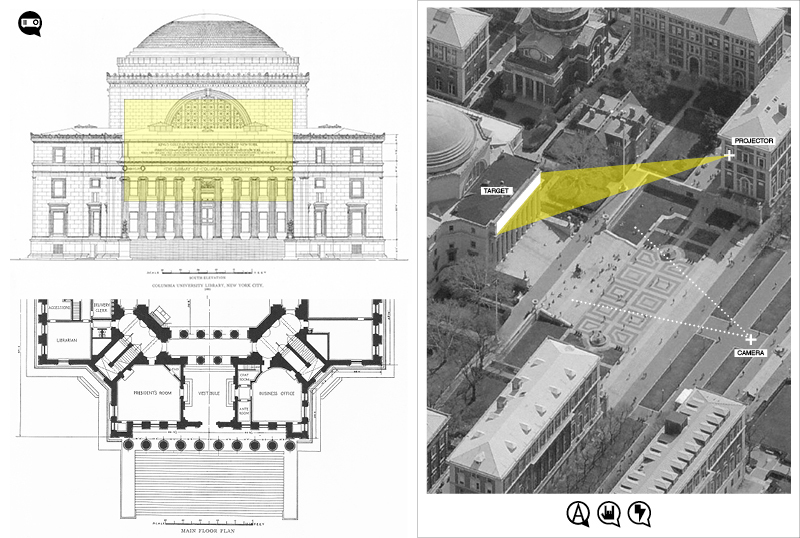 This intervention was the result of an eight-month negotiation process with Columbia University in order to seek permission for its realization, a process eventually frustrated. 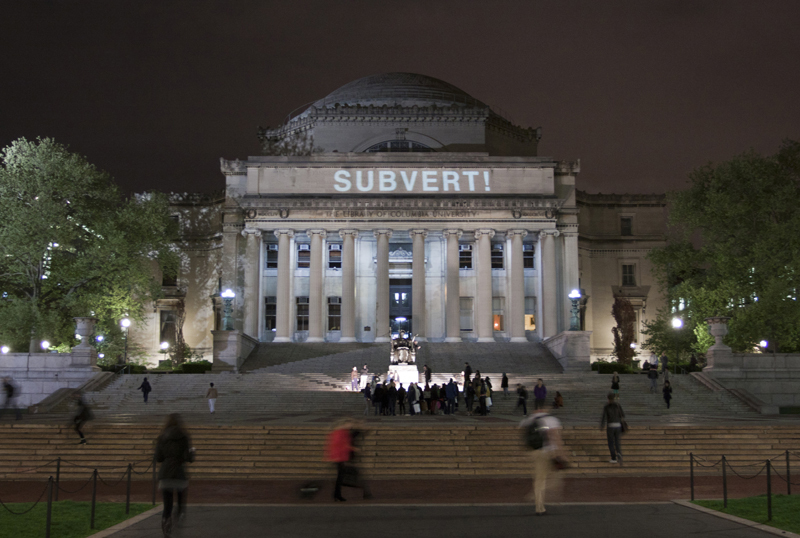 The original intention was to display audience-generated text messages on the facade of Low Library, with participants submitting messages under total freedom of speech. But Columbia University found the idea of giving voice to the community potentially harmful for the institution, and finally rejected the proposal. As an alternative, they offered the possibility of realizing a censured version of the project on the façade of Avery Hall, a less symbolic and visible building on campus. Deprived of permission to realise his proposal, Zotes decided to continue with his plans to project on the frieze of Low Library. He strategically located himself inside Kent Hall, a nearby building 100 meters away from the desired target, where he secretly positioned and operated a 12,000 lumens projector. This was the perfect location, since it provided a clear view of Low Library and the bright streetlights attached to Kent Hall’s windows rendered him invisible to the outside.